DUBIOTECH, Dubai’s dedicated biotechnology and research park and a member of Tecom Investments, has announced that private laboratory HITS is its new business partner. HITS has been awarded certification by Dubai Accreditation Centre to provide quality testing of products such as food and cosmetics for halal integrity and safety standards. DuBiotech’s announcement came at the ceremony where HITS received the certification. HITS will work closely with regulators such as the Emirates Authority for Standardisation and Metrology (Esma), the body responsible for ensuring that standards in the UAE are in line with international scientific developments, including ISO standards and the standards of the Abu Dhabi Quality and Conformity Council and Dubai Municipality. Dubai Municipality recently announced plans for a new International Centre for Halal Food and Product Accreditation in compliance with the Islamic law. HITS will be part of this drive by undertaking tests for halal food and other products to ensure they are free from any chemical or artificial additives which do not comply with Islamic law. The ability of the lab to provide halal testing contributes to Dubai Ruler and UAE Prime Minister Sheikh Mohammed Bin Rashid Al Maktoum’s vision of positioning Dubai as the “Centre of Islamic Economy.” The GCC food market is worth an estimated $85 billion and Muslim consumers spend over $1 trillion on food and more than $26 billion on cosmetics and personal care products worldwide. This is expected to increase to $1.6 trillion and $39 billion respectively by 2019,” said a DuBiotech statement. The certification presentation ceremony was hosted by Marwan Abdulaziz, executive director of DuBiotech. 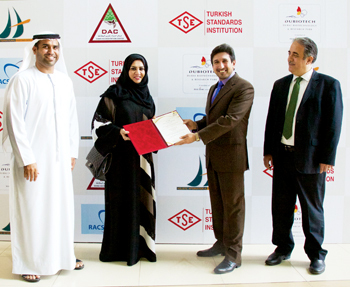 Amina Ahmed Mohammed, director of the Dubai Accreditation Department, and Hulusi Senturk, president of the Turkish Standard Institution, presented Dr Hamed Jamal, managing director of HITS, and Dr Geetha Vasan Thakumar, its chief technical officer, with the official accreditation that allows testing to begin in the new laboratory facility. Marwan Abdulaziz Janahi, executive director of Tecom’s Sciences Cluster, said: “I am proud to announce HITS as a new business partner, once again demonstrating our ability to draw vital technology to DuBiotech that benefits the whole community. We are proud to be contributing to the Islamic economy by providing a platform for halal testing and accreditation. Attracting companies such as HITS and facilitating their partnership between Esma and DAC is another example of how DuBiotech bridges the gap between the public and private sectors to support the UAE government in overcoming issues that are crucial to the residents of the UAE and beyond.